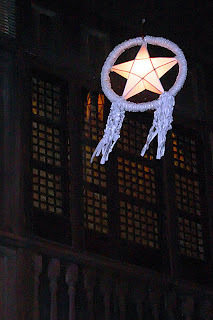 The famous Christmas icon of the Philippines, a lantern in shape of a star which graces among the Filipino streets, houses, buildings and trees every Christmas season symbolizing the star of which the three magi used as a guide to find the baby messiah on the first Christmas day. Comes in a very wide variety of colors and sizes, it also shows the creativity among Filipinos. The word parol is from “farol” in Spanish which means “lantern”. Originally crafted by artisan F. Estanislao in 1928 with bamboo covered with colored papers with a candle inside, it was first used by early mass goers (misa de gallo) to illuminate their paths.